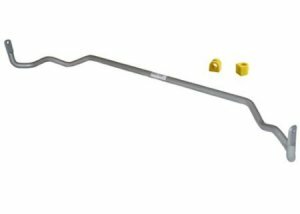 Whiteline Sway Bar: As the name suggests their objective is to reduce sway, or body roll, and stabilise a vehicle under lateral (cornering) forces. Formula 1 cars still use sway bars along side the shocks and springs as it is the ONLY suspension component principally designed to control body roll. Unfortunately, many aftermarket spring manufacturers still design their lowered springs too hard, trying to control body roll when it’s the sway bars job.